2012 Beatles Auction - A Quick Round Up. The big story about the 2012 Beatles Auction has been the ticket for the last time The Beatles played at the Cavern Club in August 1963. This 49 year old piece of history sold for £7400 on the day and while we aren't allowed to divulge the identity of the buyer we can confirm that they seem very happy with their purchase. A late sixties Cavern Club Christmas card and it's colour prototype went for £110. There were Cavern Club membership cards from various years. 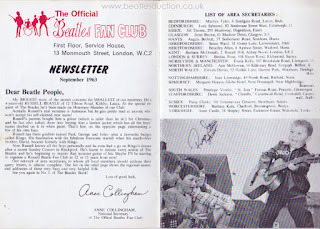 Two that covered years when the Beatles played the club raised £320 (1962 card) and £340 (1963 card). A piece of the Cavern Club stage was sold for £1700. Casbah Club membership cards are still proving very popular with collectors, one sold this year for £2000. Finally a pair of child sized Beatle boots made for the youngest, and only honorary, fan club member in the early 60s sold for £110. 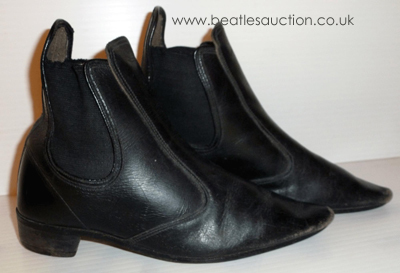 We start to take in lots for the 2013 Beatles Auction from around November. The number of lots we have time to get through in the auction is limited and we were full from around May this year and having to turn people away, so the sooner you place an item with us the more likely it is to make the auction. Valuations and advice are free of charge - see the contact page for ways to get in touch. You can now download the complete auction catalogue including photos by clicking this link. The catalogue is in pdf form. Most modern browsers are able to open these files automatically but if this doesn't work you can download a reader from adobe. Catalogues will also be available to pick up from the Beatles Shop from 13th August as well as at the venue on the viewing day and will be handed out at The Adelphi Hotel on the viewing day and morning of the event. Below are the lot numbers for items we have covered in this year’s auction blog along with links back to the original articles. Please note some items we have covered have been withdrawn from this year’s sale. 2012 Liverpool Beatles Auction Catalogue now available to download. We've updated the information previously available on this page, please click here for the updated version. Important Information about absentee bidding. We are getting several enquires about placing absentee (or proxy) bids on items in this year's auction so this is just to clarify a few points at this stage. We cannot take any bids at the moment. This is because the items are not catalogued yet. Once we know what lot numbers items are going to be we can start taking absentee bids on them. This is to keep the paperwork in order. If you email us with bids before then we won't have the system in place to make sure your bid is with the correct item. The items are being are currently being sorted into lot order, this does takes time as we have a lot of items in the auction this year. As soon as the catalogue is ready there will be details on this page as to how to get a copy, as well as being available to download in pdf format. You can bookmark this page and check back, add the feed to your feed reader to get alerts when there are new posts, or keep an eye on our facebook profile or twitter page for updates. Please note - We cannot offer any "live" absentee bidding via the internet or telephone. We do not have the resources to do this. You are free to make your own arrangements for live absentee bidding, however this is entirely at your own risk and we are not responsible for any failures in these arrangements. Please Please Me was The Beatles second single and the first to break into the Top Ten. This is an A Label Parlophone demonstration disc for that single. They were sent out to radio stations and disc jockeys to help to promote the single. This rare Beatles record is up for sale in our Annual Liverpool Beatles Auction held at The Paul McCartney Auditorium at The Liverpool Institute for the Performing Arts. It is expected to sell for between £1500-£1750. 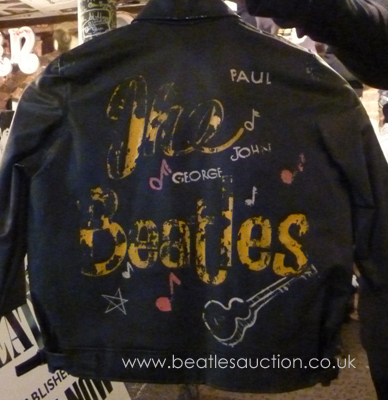 Further details about the auction are available from the The Beatles Shop, please see the Contact page on this site for details of how to get in touch. Please note – We are not taking any more items into the 2012. Space is limited each year and we already have our full quota of items. Even Beatle parents were minor celebrities in the 60s. Here’s a ticket to a church fete that was to be opened by Louise Harrison, George’s mum, in 1964. On the reverse the ticket has been signed by Harold Harrison, George’s Dad. Rare Ticket For The Beatles Last Cavern Gig. On the night the tickets were taken from those attending as they went in. Not many were able to retain their tickets. Forty-nine years and twenty-two days on from that show we will be auctioning a very rare ticket for that final performance. This concert wasn’t without incident. The Mersey Beats, who were also on the bill recall that they had told the Beatles to be careful they didn’t slip on stage as the heat from the audience in the poorly ventilated venue was causing condensation on the walls and every where was wet. All the dampness caused the electricity to fuse and the lights went off while the Beatles were on stage. Billy Kinsley (in his biography by Spencer Leigh) recalls that during the power outage Paul and John started to sing “When I’m 64” – a song that would not be released on a Beatles record till 1967 and the Sgt Pepper album! Mark Lewisohn’s book The Beatles Complete Chronicle says that Bob Wooler remembered that on the night Brian Epstein promised that the Beatles would return one day, but they would never play the venue again. About a dozen fans camped out over night to be sure of getting a good position inside the club to watch the show. In the early hours of the morning a car pulled up near by and Paul McCartney and Ringo Starr got out, chatted to those waiting for a while and signed autographs. The copy of the first issue of Beatles Monthly pictured below was signed at that time for someone who was waiting out in that queue. This is also being sold in the Annual Liverpool Beatles Auction this August. The estimate for the autographed magazine above is £500-£600. This will be the 22nd Annual Liverpool Beatles Auction organised by The Beatles Shop on Mathew Street. The auction will be held on 25th August 2012 at The Paul McCartney Auditorium at The Liverpool Institute for the Performing Arts starting at 10.30am. A viewing day will be held the day before in the same venue from 11am to 4pm. This year’s auction is now full, but we will start taking items for our 2013 event from January next year. Better images of most lots can be provided to press on request. This item has an estimate of £650-£700 and will be up for sale in our 2012 Liverpool Beatles auction in August. Click here for details of this year’s event. These large promotional posts all date from the early 70s. This one is from 1970 and features the Let It Be box set. This one is very similar to the one above but dates from 1973 as it features the “red” and “blue” albums. And finally this one is to advertise the “red” and “blue” compilations release in 1973. For the grand reopening of the Cavern Club in July 1966 the legendary club DJ Bob Wooler was called upon to write a little something about the club for the official programme of the event. These two handwritten A4 sheets contain the results of that request. It was edited a little before it was printed in the programme. These small slice of Cavern history is being sold (along with a copy of the Cavern Reopening Programme) in the 2012 Liverpool Beatles Auction. The estimate for this lot is £700-£800. Click here for details of this year’s event. Although membership cards from the years the Beatles actually played at the Cavern are usually more sort after by collectors we do occasionally come across later cards and as these are often cheaper to buy they make great items for people just starting their Cavern Club memorabilia collections. Each of the above cards has an estimate of £40-£50. These two original Cavern Club pins from 1967 are up for auction in August. They are being sold separately and are estimated to reach £50-£60 each. They are great for fans looking to start their collection of Cavern items. We had one of these 1967 Christmas cards in the auction last year. The version that was eventually produced was printed in black and white, but the original prototype for the card was actually in colour. Both versions are in this lot going into our 2012 auction this August. The estimate on the lot is £40-£50. Rock Around The Clock at The Cavern! In April 1968 the Cavern Club played host to a rock and roll legend – Bill Haley. The support was a band called Kaspers Engine (which we think were from Bebington) and Billy Butler compered the evening. This ticket for the show is going into our auction in August and has an estimate of £30-£40. Bob Wooler was the DJ in the Cavern Club and a very well known person on the Beatles scene. Before his death, a little over a decade ago, he was working on a biography. Eventually this was published, written by the local music historian and author Spencer Leigh. However, at one point Bob handed some type written pages over to another local writer asking him to finish the job. Two of these pages are up for sale in our auction this August. The two A4 sheets, typed on Bob’s typewriter, recall how the DJ’s drink was spiked with prellies by John and George as well as other comments about John Lennon. This historical document goes under the hammer on Saturday 25th August as part of the annual Liverpool Beatles Auction organised by The Beatles Shop. It’s estimated value is still to be confirmed. The vendor is donating the proceeds to charity. Please contact the The Beatles Shop for further details. As mentioned in a previous post we have a number of items in this year’s auction from Freda Kelly’s personal collection. This includes a number of photographs that she collected over the years as the secretary of the Beatles Fan Club. These are just a sample. None of the photographs are being sold with any form of copyright. These lovely autographs from Paul and Linda McCartney were written on the back of a cigarette packet. The vendor was lucky enough to be in the same pub on the Wirral as the McCartneys while they celebrated the New Year in 1982/83. They even got a couple of photographs which are included with this lot. We have a few lots in the auction this year from the collection of Freda Kelly, the secretary of the Beatles Fan Club in the 60s. This Christmas card given to Freda in 1965 looks, at first, to be signed by all four of the Beatles. However it is in fact a set of Beatles autographs that were done by the road manager (and later head of Apple) Neil Aspinall. It was common practice even from the early days to have someone else sign autographs to be given out. Neil seems to have been particularly expert at it! NB: As stated these are not genuine Beatles autographs and are not being sold as such. The Beatles relatives were often asked to get autographs for fans, but also they were occasionally asked to sign autographs too. 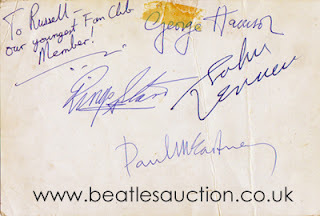 Here’s Louise and Harold Harrison’s signatures on the reverse of a Beatles promotional card. John lived with his Aunt Mimi on Menlove Avenue for most of his childhood. We have two Mimi related items going into this year’s auction. And there is also a two page handwritten letter from the eighties from Mimi. Bob Wooler and Allan Williams used to be well known verbal sparring partners at Beatles events until Bob passed away a decade ago. Bob was the legendary Cavern DJ and Allan is “the man who gave the Beatles away” In fact this was the title of Allan’s book. A copy of this book is up for sale in our auction and it has been signed by both Allan Williams and Bob Wooler. In 1969 Ringo Starr went into business with designer Robin Cruikshank. The company, which existed until 1986, was call Ringo Or Robin Ltd.
We have a short strip of ROR stickers up for sale in our auction in August. They are estimated to sell at £30-£40. The second smaller mirror features an apple in its design. This mirror carries an estimate of £100-£125. At the age of four Russell Jamieson was already an huge Beatles Fan! Click the image below to read about him in issue two of Beatles Monthly. The jacket Russell is wearing in the picture was specially decorated for him and he even had a tiny pair of Beatles boots. His story appeared in the local press and he was adopted as the youngest and only honorary member of the Beatles Fan Club. He got to meet his idols and even got tickets to watch them record Juke Box Jury at the Liverpool Empire. He was also sent a full set of Beatles autographs with a personal message for their youngest fan. Several items from Russell's personal collection are going to be up for sale in our annual Liverpool Beatles Auction. 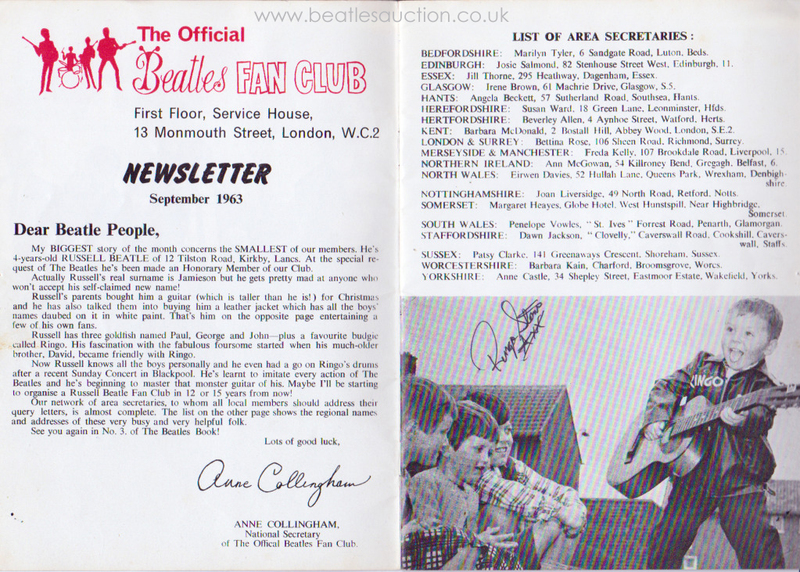 These include his jacket, the autographs, his boots and several letters from the Fan Club, Tony Barrow and from Beatles fans who wrote to him after his appearance in Beatles Monthly Magazine. The design on the back of the jacket. 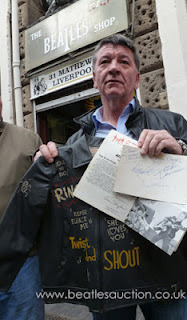 Russell today, with his jacket and autographs outside the Beatles Shop. The jacket and autographs are being sold in one lot with an estimate of £7000 while the boots are being sold along with some of the letters from Beatles fans and are estimated at £100-£150. The estimates on the other letters will be available in the auction catalogue, available in early August. The auction takes place on August 25th 2012 at The Paul McCartney Auditorium at LIPA. It is organised by The Beatles Shop on Mathew Street. Contact details are listed on the right of this page, and potential vendors and buyers should read the FAQs and the relevant buyers/sellers notes. This ticket for the rock and roll legend Jerry Lee Lewis has a Beatle connection. His backing band The Echoes were without a drummer and as Rory Storm & The Hurricanes had not long returned from a stint in Hamburg, Ringo Starr sat in as the drummer on this gig! This mint condition ticket carries an estimate of £60-£80 and is due to be auctioned in the Annual Liverpool Beatles Auction organised by The Beatles Shop. This year’s event takes place at the Paul McCartney Auditorium at the Liverpool Institute for the Performing Arts on Saturday August 25th 2012. These table lamps were produced in the 70s (though sometimes people mistakenly label them as original 60s products). They came in a range of colours and feature designs on both the lamp base and the shade. Up for auction in August are two Beatle related street signs. Mathew Street, home to the Cavern Club and the Grapes Pub. and Forthlin Road, the street where Paul McCartney once lived. These sign have an estimated value of £70-£90 each. Ringo has appeared in quite a few films in his time, and we have advertising posting for some of them going into our auction in August.